The Johan Cruyff Foundation supports and develops sports activities for children in need all over the world. Through sports projects for children with a disability and projects like the Cruyff Courts and Schoolyard14 we create space for children. Space to grow. Space to make friends. Space to improve physical and mental health. Space to become who you are. Sports and play are an important part of a child’s proper, healthy development. 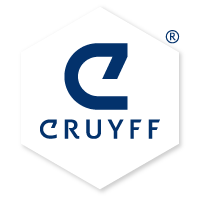 Based on this vision, Johan Cruijff founded the Cruyff Foundation more than twenty years ago. Sport improves the fitness of children, teaches them to interact, and helps their personal development. Unfortunately, not every child can easily take part in sports and play, for example because of a lack of space. Through projects like the Cruyff Courts, Schoolyard14, and sports projects for children with a disability, we give children the space to take part in sports and be active. We do this all over the world, as it is necessary to help children anywhere in the world stay healthy and to work together to help them hold their own in this often complex society. In doing this, we are still working from Johan’s values: professional, self-willed, involved, positive, connecting, accessible, and passionate. Our social relevance is bigger than ever. Children spend more and more time in front of a screen and spend less time being active and playing outside. Their world is becoming more individualistic, while obesity is on the rise. In other places on the world, there is a lot of poverty, drug abuse, and gender discrimination. This prevents children from getting the most out of themselves and may even lead them astray. Sport can make a change for all these children, as sport is a universal language for children, regardless of their background, culture, religion, or ability. Sport fosters personal development, self-confidence, and connection, things that every child, anywhere in the world, is entitled to. This is why the Cruyff Foundation creates space for children. To get and keep them active.